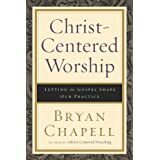 Christ-Centered Worship: Letting the Gospel Shape Our Practice ReviewI can't believe I am the first to review this book. Perhaps the rest who have read it are still sitting with their mouth open in praise or mental gears grinding or bent knees in repentance or contiuing to experience some Aha moment. Usually I will express my gratitude to Dr. Chapell privately. As his former student, and one who has read just about everything he has written, sometimes multiple times (Christ Centered Preaching), Christ Centered Worship did not just inch up my favorites list, it pole vaulted to first place. Being a young pastor, I have learned so much about worship and its importance from many other of my heroes. I have not had the benefit of working as associate pastor and learning that way. It has been most trial and error, with lots of error and confusion (Thank God our church is so gracious), lots of podcasts by Tim Keller, DA Carson, John Piper, and others (thank God for the internet and these pastors who continue to teach me about the Gospel and Worship), and through lots of reading (thank God for kindle though I crashed it three times this morning trying to highlight and make too many notes in this book). I almost copies the whole thing! One of the things that has been so hard for me as a pastor is to see the historical flow of worship liturgy and its relationship to the gospel and why we do the things we do. Many of these things I learned at Covenant. But after preaching for 8 years, and having them "represented" so clearly pushes understanding and appreciate and freedom deeper and broader. In so many ways this was very practical. Let me give you three, in my words (not Dr. Chapell's), that will give you some "lived body detail" of the effect this book has had just in its first reading (definitely a re-read). I was telling our associate pastor who leads worship about this boosk and the movement in the LORD's Supper from Luther to Calvin to Knox. We were talking about the fellowship aspects (In Scotland they sat around tables to share the meal), and greeting one another. In many churches, we often wonder what to do with greeting at the beginning of a worship service before a call to worship. It never occurred to me that a welcome and greeting could take place in worship. We also have a time of testimony in our church. As I was reading about the historical unfolding of these liturgies, I had my own convergence of thoughts applying what I was learning. Would it be possible, after the LORD's prayer, and before the LORD's Supper, to have a time of greeting and welcoming one another in love to a shared meal (the reconciliation that takes place at the cross)? Could this also be a family way of fencing the table? "As you greet one another, if you've got something against a brother or sister, make sure you go to them before coming to the eat from this table of grace." Another running thought as I read came with Luther's emphasis on celebration, in contrast to Rome, and the reality that Jesus is not recrucified every week, and we do not re-propitiate God in worship or the LORD's Supper. Rather, worship is a gift from God to us, the Sabbath is for us. We don't have to repropitiate God by coming to him in worship assuming he is angry with us for messing up this week. Rather, God has been propitiated in Christ once for all, and invites us to come not to Sinai but to Mount Zion. Thirdly, just a reorientation to the idea of the "priesthood of all believers." I have mostly thought about that in terms of all vocations being valuable, but mostly my thinking about this has been outside worship. I don't know why. Perhaps it is all the reformed emphasis on worldview. It was very helpful just to consider the participatory implications of the priesthood of all believers on the worship event itself. Want to learn more information about Christ-Centered Worship: Letting the Gospel Shape Our Practice?